Kanye West, who has remained defiant amid backlash over his support for President Donald Trump, said that he reached out to Colin Kaepernick to try to arrange a meeting between the former San Francisco 49ers quarterback and the president, saying, "we keep having the conversation until the conversation turns to love." "I’ve been calling Colin this morning, reaching him, so I can bring Colin to the White House and we can remove that s--- of b------ statement and we can be on the same page,” the rapper, donning a "Make America Great Again" hat, told TMZ on Monday. At a campaign rally in Alabama on Sept. 22, 2017, Trump ignited a feud with the National Football League and players who take a knee during the National Anthem to protest racism, where he called on NFL owners to fire them, suggesting they say "get that s-- of a b---- off the field! He's fired, he's fired!" During a visit to The Fader offices on Thursday, West was spotted sporting the red Trump "MAGA" hat with a Kaepernick sweatshirt. Kaepernick, who was the first to take a knee during the playing of the National Anthem in 2016 to protest racism and police brutality, and others who followed suit have been at the center of Trump's ongoing fight with the league. 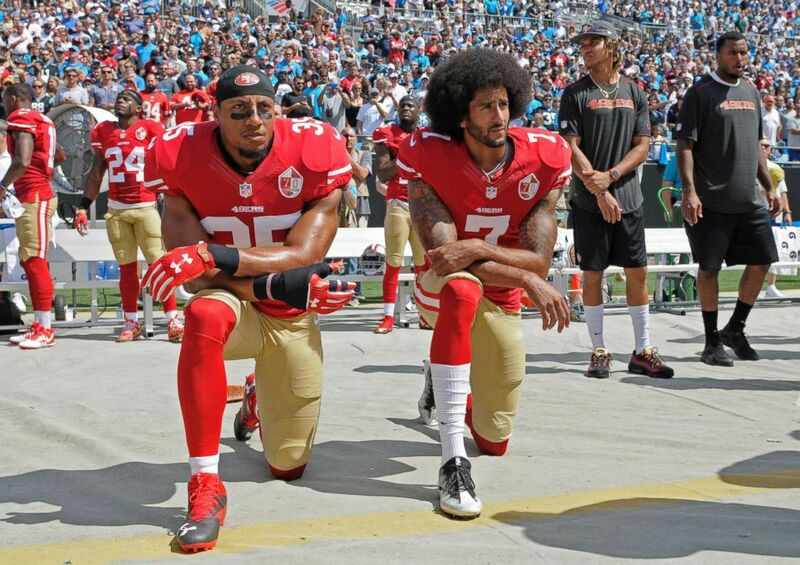 San Francisco 49ers' Colin Kaepernick (7) and Eric Reid (35) kneel during the national anthem before an NFL football game against the Carolina Panthers, in Charlotte, N.C., Sept. 18, 2016. "We never give up on anyone," the rapper told TMZ. "Let me even make that more positive, we move forward, we give love, we keeping going, we keep having the conversation until the conversation turns to love." ABC News reached out to the White House and Kaepernick but requests for comment were not immediately returned. During an appearance on "Saturday Night Live" over the weekend, the hip-hop mogul wore a “Make America Great Again” hat and dove into a passionate, pro-Trump rant on live TV. The next day, his tweet defending the hat drew even more criticism when the rapper wrote that it's time "we abolish the 13th amendment." "This represents good and America becoming whole again. We will no longer outsource to other countries," he tweeted, along with a selfie of him wearing the "MAGA" hat. "We build factories here in America and create jobs. We will provide jobs for all who are free from prisons as we abolish the 13th amendment. Message sent with love." The Thirteenth Amendment abolished slavery in the U.S., "except as a punishment for crime whereof the party shall have been duly convicted." Amid a firestorm from fans over his comments, West later tweeted that "the 13th Amendment is slavery in disguise meaning it never ended We are the solution that heals." In another tweet, he added, "not abolish" but "let's amend the 13th amendment" — a clarification he repeated during his appearance on TMZ. Meanwhile, Trump, who has repeatedly touted West’s support, gave him a shoutout on Sunday morning.